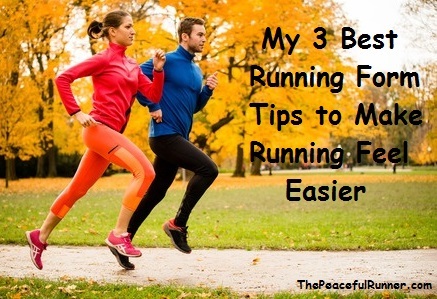 We hope you enjoy this month's newsletter -- My 3 Best Running Form Tips. If you find it helpful, please be kind and share it with your running friends! The main goal of this website is to help runners by providing advice to help make running feel easier, more effortless and more enjoyable—all in the pursuit of our ultimate goal of running injury free. One of the best ways to make running feel easier for us is to improve running form. A couple of little tweaks in our running form can make a huge difference in our running performance, obtaining a proper running form and reducing running injuries. Try integrating the following 3 running form tips into your running form. Pay attention to your hips when you are running. Keeping your hips forward helps keep your body in alignment. When your leg moves forward, the hip should move forward with it. Our hips are very powerful and we are not fully utilizing their energy if we don't incorporate them into our leg movements. A slight bend in the knees will reduce the impact on the feet (and the body) and encourage a forefoot landing. This allows your steps to be soft and springy with a quick turnover rate (cadence). Also, keeping your knees bent makes running downhill much easier. You can let go and take advantage of gravity to boost your downhill speed. "In the long run, we shape our lives, and we shape ourselves. And the choices we make are ultimately our own responsibility." Many runners make the mistake of leaning from the waist. Running this way actually takes much more effort than a straight posture. Practice standing tall by using visualization. Imagine a book a few inches above your head and then try to reach the book with the top of your head. Keep your hips, shoulders and ankles in straight alignment. However, a slight lean from the ankles will help you move forward more easily and reduces the risk of overstriding as your feet will land beneath your center of gravity.